Today I unexpectedly ended up with time alone with my middle child, a daughter between two sons. I knew based on a recent family therapy session that she had feelings of being somehow left out, just outside whatever is going on in the house, a sense of being unnoticed. It struck me as so odd at the time that she would feel that way because, from my perspective, she seems to always insert herself in the middle of everything going on. I didn’t fully understand she did this in an effort to remain always included. I wrote this letter to her in my head, and I hope, at just the right moments, to be able to convey some of these things delicately to her with my heart over the holiday season when we have more time together. If you are or have (a) middle child(ren) in your home, I hope you find something in this that speaks to your situation as well. First, let me start off by saying that Mom was not the middle child. I was the youngest. Dad was the middle child, just like you, although in his case: a son between two daughters. It must be a challenge somedays figuring out who you are. Are you mature enough to get the same benefits and responsibilities as your older brother? To have an iPod Touch when he does? To know grown-up stuff that he does? Or are you still wanting to grab your childhood and be young like your little brother? I imagine that walking through each day uncertain which role you want must be confusing, complicated, and frustrating at times. Some days, you may not be sure how Dad and I view you. Or you may want to change it up now and again, and we’re slow on the uptake, not realizing which one you are in that particular moment. When your little brother is in the room, you like to feel older, sharing a bond of knowledge and growing up with the one above you in age. When your older brother comes into the room, you perhaps feel awkward caught playing with the little guy when you want to be esteemed as mature by the oldest. What you don’t know is that I’m in no rush for you to grow up, and that when you are in Play World, I get to see how much you have kept sweet, innocent, and free. And the oldest doesn’t fault you for it either. He doesn’t hold it against you or find you less mature. He misses Play World, and while he’d never maybe say it to you—or me—he envies you still getting to be in there. I also see you walk a balance of wanting to mother and nurture the one below you in age but receive that same safety and protection from the one above you. You do both beautifully, but I can see where you aren’t ever completely sure which one you are: Nurturer or Protected. I want to tell you, sweet girl, that you are both. Always. Because God put you in the birth order right where He wanted you. And the best part is: You don’t have to choose. I love when you share a more mature conversation with your teenage brother before the little one comes home. Sometimes, you feel stuck there and get a little haughty about how big you are; you might even get a little disgusted when the little one doesn’t know something yet that you do. You might feel impatient with him. You might wish he’d catch up. But if he caught up, you couldn’t enter Play World now and again. You couldn’t experience those caretaker moments that you do when Little Man looks up to you, and you get to be Big Sis. I know you often seem to think there are conversations going on around you that you aren’t a part of. And yet, what you don’t realize is how much we take your input, we hear you advocate for a brother, we listen to what you have to say. But it’s hard, because when you are the middle of the sibling sandwich, the bread on either side seems to get more attention: The one going first is our practice round, and the one going last has greater dependence at his age. But you don’t see yourself as the peanut butter in-between bringing the bread slices closer together. And that’s exactly what you do. It’s amazing to watch. I see you playing tug-of-war with yourself over which child to align yourself with, and I can appreciate that fine balance and the daily struggle, My Love. But I want you to know that you get to be the middle of the sandwich, and with that, comes as much blessing as aggravation—as much extra love as feeling a bit unsure at times. You may feel like you are on the sidelines while the action goes on in the different ends around you, but to us, you are critically needed and loved because you bring balance and input that nobody else here can offer. So, my sweet, middle child with your sense of justice and keeping track, Mom wants you to try to rest, relax, and look for where your role is so vital, so important, so blessed. You touch our family deeply with your ability to play both roles. We love both your childhood and your growing up! We love keeping you free of the worries of the older one a little bit longer but also being able to hand you more responsibility and mature conversations. We love when you delight the youngest with the Play Sparkle you still have inside you when you need it. Rest, my child, in who you are. And if you can do this, you will be so incredibly gifted in social navigation and dynamics because you walk the balance every day of your life and know so much about how to relate to different ages and different personalities. Trust your dad and me to keep things fair. And play in your room still—as much as you can! Freely love on Little Man. And let your older brother take you under his arm and teach, guide, and protect you. As you give as teacher to the one below you, freely receive from the one above. You can do both things well. You don’t have to patrol or be on guard. You truly aren’t missing anything. If anything, you get a double dip into family dynamics and sibling relationships. You have insight we all can learn from. We learn so much from our sweet “middle.” You are absolutely needed and very deeply loved. 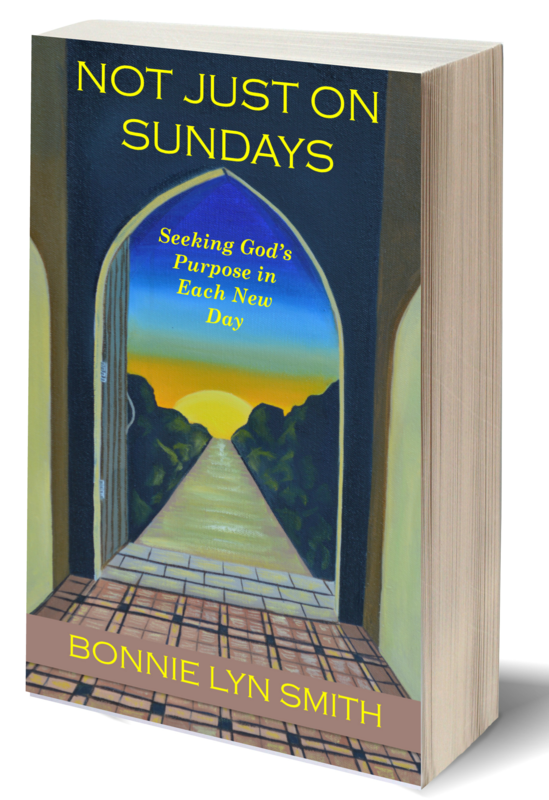 *More anecdotal stories about faith, family, and relationships can be found in Not Just on Sundays: Seeking God’s Purpose in Each New Day (includes Book Club Discussion Questions). **This post has been shared with Mom 2 Mom Monday Link-Up, Make a Difference Mondays, Pick Your Pin Tuesday, Breakthru Linkup, Grace & Truth, A Little R & R, Dance With Jesus, Faith-Filled Fridays, Saturday Soirée Blog Party, and Christian Mommy Blogger. Thanks, Bon! This ministered to me, as a middle child! This is so sweet. I think this could go to even right now my daughter who is my baby. She is just in that stage where she still wants to be a little girl, but also wants to be a young lady and it is a tough thing to navigate. Thanks for sharing. Yes, kcgroves, I feel like we’ve been in that stage for about two years. The struggle is visible some days. I remember it myself. I love still seeing the carefree moments in her. I’m not sure I’m ready to abandon the sweetness of childhood for the growing burdens and responsibilities (and awareness) of adulthood. But ready or not, here they come! Thanks for coming by! Oh Bonnie! This is just beautifully written! Your insight and attention to her needs and desires and behaviors reflects your deep love for her… I think this letter is just perfect. I’m guessing every middle child experiences much the same. She will love this letter… it’s one for her to cherish always. Thanks, TheMomCafe! 🙂 So much great stuff about being a middle child once they can see past what they think is the bad stuff about being one. LOL And 12 year old girls…such a sweet mix of childhood and wanting to grow up, right? Your insight is so helpful, Bonnie. I never thought about my middle child trying to decide if he’s more like the older or younger child, trying to relate to both, feeling like neither. Thank you for this! Hi, Janet! Thanks so much for coming by and sharing your reflections! I can only imagine what they think and feel since I was the youngest of two. 🙂 Blessings! I love this! 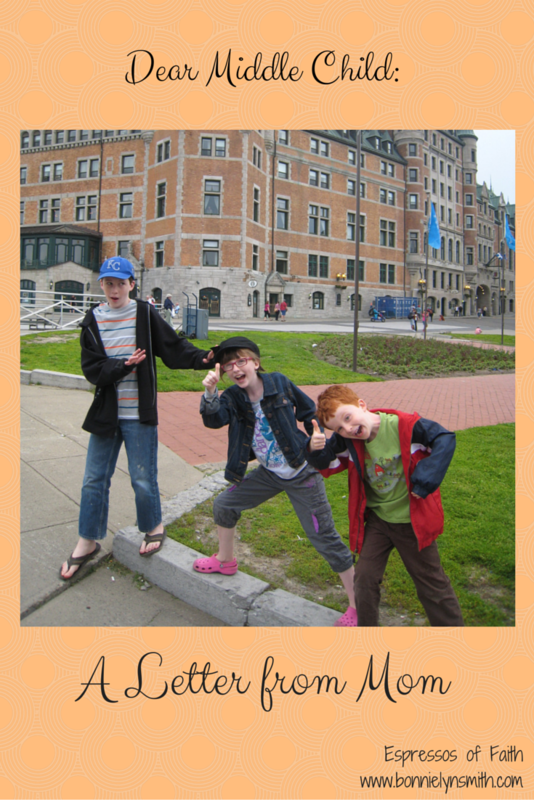 I was the youngest and my husband stu the oldest so sometimes we worry about our middle child. Everything you have here is so accurate And I can appreciate it so much. Thank you! Oh, thank you so much for the encouragement, Stephanie! I’m so glad to hear that. Sometimes these things feel so personal, I never know if it speaks to anyone else! Thanks again!